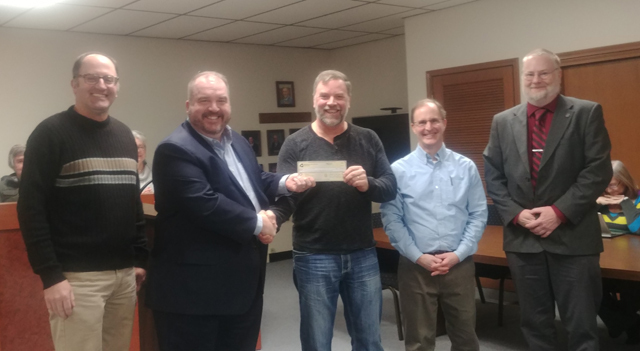 Harrisonville City officials took another step towards improving the city’s electric distribution system on Monday night as they accepted an $116,550 grant from the Missouri Public Energy Pool (MoPEP). The grant is a part of the MoPEP Power Infrastructure Modernization Grant Program and is being used toward the cost of upgrading the city’s electric system, including new transmission lines for an area near Precision Drive, and the rebuilding of a line for Forest Street. Mayor Brian Hasek, City Administrator Happy Welch and Public Works Director Eric Patterson accepted the award on behalf of the City. The grant is the second that the city has received from the MoPEP program. A previous grant was made in 2015 for more than $91,000, and was used for part of Harrisonville’s cost to install new fiber optics for the city’s electrical SCADA system. The MoPEP Power Infrastructure Modernization Grant Program assists MoPEP municipal utilities to invest in long term capital assets of their local electric systems, to improve reliability and efficiency of electric infrastructure for systems supplied through MoPEP. Funds requested under the program must be used for improving assets and operations used in the electric utility.